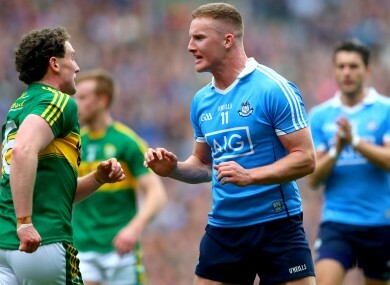 Ciarán Kilkenny dismisses talk of a media ban and says Diarmuid Connolly will be back in blue this summer. JUST THREE DAYS after Jim Gavin broke character in laying down the law to various media outlets, Ciarán Kilkenny returned to the scene of his manager’s most evocative public moment to date. His task was rather straightforward: speak with the media. There were those who felt Gavin committed blue murder in denying RTÉ a one-on-one interview following his side’s spectacular annihilation of Westmeath in their Leinster semi-final, with others maintaining this was merely an attempt to create a siege mentality, and an extra edge in a year where his back-to-back All-Ireland champions may well require it if they are to climb the steps of the Hogan Stand in September. Two-time All Star Kilkenny wasn’t too bothered in any case, and claimed he was unaware of the controversy as it unfolded at Gavin’s press conference. “No, I suppose you’d be too busy showering down and getting the shampoo in and everything like that,” he said. “After the game, lads generally get beside each other and discuss the game and have a bit of craic, and discuss what the girlfriend is wearing back to the hotel or what the plans are for later, so we wouldn’t really know what’s going on. “Straight after the game, I was oblivious. You wouldn’t be knowing what’s going on in the background. The players’ willingness to move on might beg the question as to why Gavin decided to recycle the Connolly drama at all. Regardless, as far as Kilkenny is concerned, chatter regarding a ban on Dublin players partaking in one-on-one interviews was wide of the mark. Here he was, after all, at Croke Park to speak to a number of journalists – this at an event to promote Sure’s ‘Never More Sure’ series, which has been launched in celebration of the company’s second year as Official Statistics Partner of the GAA. I was just told to go today and do whatever. ‘Talk to whoever you have to talk to’, was what I heard. From my understanding there’s no media ban, or anything in place at all. “Look, we try our best not to look at what’s happening outside our football, because it can take away from your energy towards your training and performance. But I came here today to do this, and again, from my understanding there’s no ban at all. Asked if a player other than Connolly would have faced the same scrutiny if they had breached the rules in a similar manner, the Castleknock man abruptly replies, “Don’t know, no,” complete with a chuckle and a stare which suggests it is indeed time to move on from the summer’s biggest saga since news emerged that Mayo’s Aidan O’Shea had once posed for selfies with fans after a challenge match versus Meath. There are, however, a couple more curiosities where Connolly is concerned. For example, former Dublin manager Tommy Lyons recently suggested to RTÉ’s GAA podcast that it would be too difficult for Connolly to remain match-fit until August, and that his season might be over. Kilkenny, however, curtly disagrees with such a hypothesis. He’s more hesitant when asked if Connolly has been training away with Dublin since his suspension. “He’s kind of… Emm… Next question!” is the response, this time with an outburst of laughter. The soon-to-be-24-year-old seems relieved in his recognition that it’s his right, if not his obligation, to remain tight-lipped on occasion. Later in the afternoon, he confirms that Connolly is working on an individual training regime separate to the rest of the Dublin panel. On to purely footballing matters, then, and Kilkenny is careful in his response as to whether he felt sympathy for Westmeath at the weekend. This was, after all, a side who had reached the last two Leinster finals, but in this year’s semi versus the same opposition lost by a wider margin than both the 2015 and 2016 showpieces combined. Dublin’s 31-point victory was a record under Gavin, but Kilkenny is quick to point out that their near uninterrupted dominance over Leinster opposition remains a relatively recent development. He’s just 23, but still old enough to remember bleaker times in the capital. “Was it a record, was it? You’d be better off asking the Westmeath players what their opinion would be, because they’re the ones who put the hard work in. Kilkenny scored six of his side’s 41 points, including a first goal not just in the Championship, but at Senior level for his county. It was a long time coming, as he was duly reminded by a number of old pals post-game. “First goal, yeah! Ah, you wouldn’t really be thinking about not having scored one, but at the same time it was nice to get a goal. I hadn’t experienced it in Croke Park before, and it was a great adrenaline buzz. There was good banter flowing in the dressing room afterwards, anyway. There was a good bit of slagging going on. It’s when discussing the culture of leadership within the Dublin ranks, regardless of age or experience, when it becomes clear just what an influence the elder Brogan brother was to Kilkenny when he was introduced to the Senior panel as a teenager five years ago. As neighbours, they remain close both figuratively and literally, and Brogan’s jibe after his understudy’s first goal in sky blue was far from an isolated incident. “In 2012 when I started, I had only just done the Leaving Cert, a young buck, but Barry Cahill and Alan Brogan used to give me lifts to training. I would have been keeping quiet then as a youngfella,” Kilkenny admits. “But I’d chat with Alan now very often because he’s only living down the road. We had a couple of good contests there with our clubs, so there’s plenty of slagging going on. Kilkenny gained the upper hand during their most recent on-field clash. On May 13th, his Castleknock side – in just their third year at Senior – bested the Brogans and Paul Galvin in a tremendous 2-18 to 2-15 victory at Parnell Park. Alan Brogan would reportedly tell the victorious Castleknock dressing room that it was one of the greatest club games he had ever participated in during a gracious post-match speech – a sentiment echoed by Kilkenny six weeks on. “Oh my God, like. It was like the pace of an inter-county game. It was incredible. But while parochial encounters might be conducive to jovial taunting between part-time rivals and long-term friends, Kilkenny assures that the inter-county scene is scarcely different. One aspect of the GAA which has survived the cloak-and-dagger, tell-them-nothing era, he says, is communication between players from different counties. “Ah, it’s generally the same at inter-county level, to be honest. Especially with lads you’d have gone to college with. I would have played with lads from Roscommon, Donegal, Westmeath and elsewhere. There’s still plenty of slagging going on between players from different counties on Snapchat. Or you’d message them just to keep an eye on them: ‘How are youse getting on?’ Winding each other up, again, like, and having the craic. You need that – to be able to speak to other lads from different counties. That’s important. And while Dublin might sit pretty at the top of the mountain for now, it doesn’t mean Kilkenny is immune to the odd leveling from fellow players of other county colours. “Sure, when you’re in Ireland, there’s plenty to be able to slag someone about,” he laughs. “The back-and-forths would be flowing, all right, and once it starts between players it just keeps going. It’s great. He might have heard that one from elsewhere this week. Email “'There's still plenty of slagging going on between players from different counties on Snapchat'”. Feedback on “'There's still plenty of slagging going on between players from different counties on Snapchat'”.